Earlier this evening it became apparent that that a low level spin was forming southwest of Naples, FL. Radar and satellite confirm very heavy rain in bands lifting northward. It concerns us some, due to the fact that these small vorticies can spin up quickly. It is not out of the question that a tropical depression or even possibly tropical storm forms from this vorticity before landfall near St. George Island midday Sunday. If the system forms or not, look for heavy rain to move northward along or just offshore of the Florida west coast into northern Florida tonight and Sunday. As mentioned last night, small vorticies can spin up very quickly. Thankfully this tropical cyclone will not spend much time out over water, limiting its development. Landfall is expected this afternoon still near St. George Island or a little east of there in Apalachee Bay as a tropical storm. Claudette will likely be named on the 11 am edt advisory. 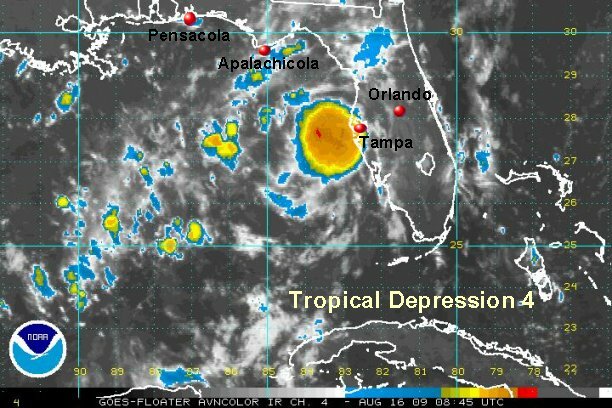 As of 5 am edt / 4 am cdt tropical depression 4 was centered at 27.7 N / 83.9 W or about 90 miles west southwest of Tampa, FL / 155 south southeast of Apalachicola, FL. Top sustained winds are estimated to be 35 mph - which agrees with NHC. TD4 is moving north northwest at 16 mph. Heavy rain will likely be the greatest impact with 3-5" in the path of the low. Also expect higher than normal tides near and east of where the center makes landfall. NHC held off from naming Claudette at 11 am edt. They are waiting for a recon report to be sure. The low should make landfall late this afternoon near Apalachicola and skim the coast toward Panama City as it heads into southern Alabama tonight. Rainfall with estimates of 10" are already seen offshore of Tampa in the banding. 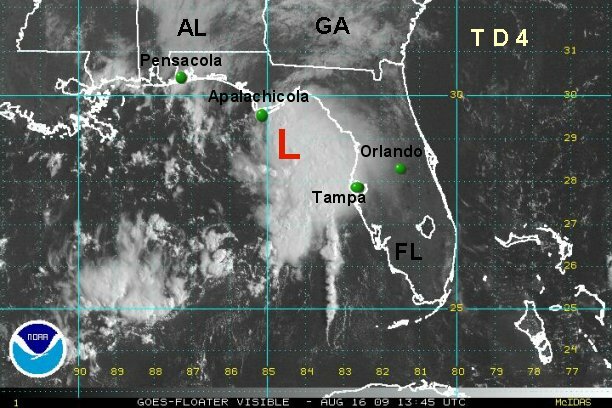 As of 11 am edt / 10 am cdt tropical depression 4 was centered at 28.7 N / 84.6 W or about 75 south southeast of Apalachicola, FL. Top sustained winds are estimated to be 40 mph - NHC held at 35 for the recon. TD 4 is moving northwest at 14 mph. Heavy rain will likely be the greatest impact with 3-5" in the path of the low with locally 10"+ in the slower bands. Also expect higher than normal tides near and east of where the center makes landfall. The next complete update will be this evening. Td 4 ( Claudette ) will be inland and starting to weaken by then. 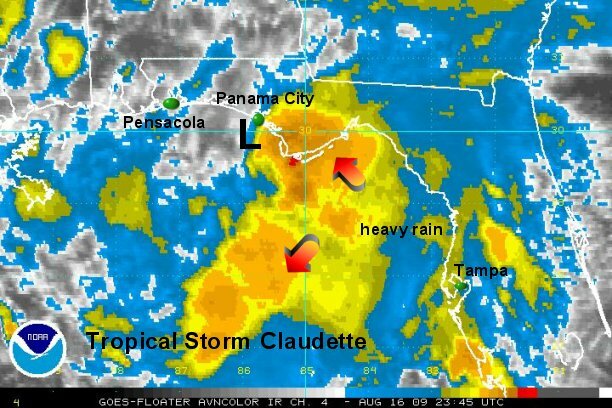 As expected earlier today, NHC did name Claudette. Heavy rain is now pounding Apalachicola, FL and to the east into Apalachee Bay. Some heavy rain bands are well inland in Georgia and Alabama. 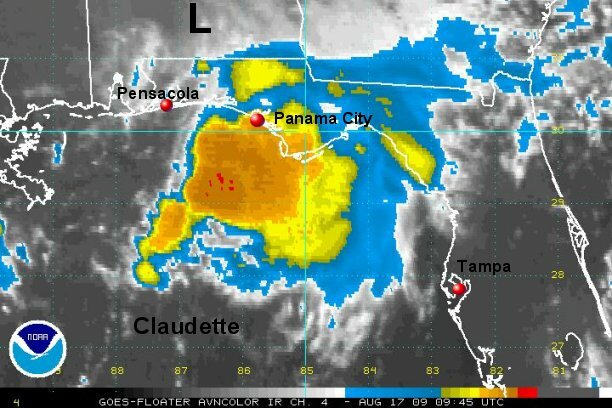 As of 8 pm edt / 7 pm cdt Claudette was centered at 29.7 N / 85.9 W or about 25 south Panama City Beach, FL. Top sustained winds are estimated to be 50 mph. Motion is northwest at 12mph. Claudette will weaken tonight as the center crosses land in the next few hours. Heavy rain will likely be the greatest impact with 3-5" in the path of the low with locally 10"+ in the slower bands. Claudette is now centered in southern Alabama about 20 miles north of the Florida border near Monroeville. Top sustained winds are estimated to be 40 mph ( same as NHC ). Strongest winds are offshore and not associated with the low center inland. Motion is northwest at 12mph. Doppler estimates are now 6'+ offshore of the north florida coast. Heavy bands are setting up between Pensacola and Panama City. Totals of 2" have been estimated so far. Claudette will be downgraded to a tropical depression on the next advisory. This will be our last update on Claudette, except for a summary later today or tomorrow.